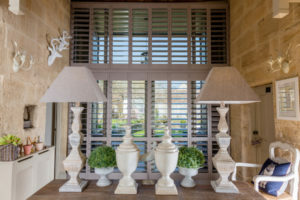 We are the Winchester plantation shutters specialists. We work solely with Plantation Shutters. Investing in these beautiful window coverings will enhance any room in your home or business. We pride ourselves on being able to offer the widest selection of materials, colours and finishes. We even fulfill the requests of top interior designers! Our Plantation shutters are made to measure so they can be fitted to almost any window shape, including angled, arched and round windows, even the intricacies of glass roofs and conservatories. We are proud of our caring family ethos and exceptional customer service record. All our people are aware your house is your home and we work extremely hard to cause minimum disruption. We chose to franchise the business so we could select similarly passionate and enthusiastic people to fulfil demand, whilst still offering an exceptional local service at the most competitive price. To discuss investing in Plantation Shutters for your home please contact your local Just Shutters on 01962 670157. Enhanced light, increased security and an “increase in the value of your property”! These are just some of the reasons that people have been seeking out Winchester’s own plantation shutters company. Just Shutters Winchester has been a real success story over the past decade. A family run company, Just Shutters specialises in Plantation Shutters – sometimes known as wooden shutters or shutter blinds. Just Shutters offers a specialist service with an in depth knowledge and passion that is rare to find. Your local expert is Rob Wardle a gentleman with an eye for detail and accepts nothing less than perfection. To read more on the background of Just shutters, and to browse our vast range of shutters, please click here. Visit our Checkatrade profile to see why we are rated 10/10! In a city with the history and the number of beautiful old buildings of Winchester, Plantation Shutters, fitted inside the window, are the perfect choice. Perfect to enhance both the look and the feel of your property. Back in history, Winchester, based in Hampshire on the South Coast of England, was the capital of the ancient kingdom of Wessex. Now it is famous for its historic buildings such as the stunning 1000 year old Winchester Cathedral, University and College. The many buildings built in a similar style to these famous landmarks, make Winchester one of the most desirable places to live in the country. The owners of such homes understandably want a window covering that will enhance them, both in appearance and in value. It is not only owners of older buildings that take advantage of Plantation Blinds however, many people in Winchester and across England choose our stunning shutters for all ages of property. Home owners increasingly install shutters for the design element that they bring to their home. But shutters are highly desirable for many other reasons. Popular for the way they can filter light into a room, bringing a room to life and enhancing its best features, as well as additional benefits such as the enhanced safety they bring to a home. Not to mention the fact that they are maintenance free and need almost no up-keep once they are installed. There is a wide range of shutters to match any budget and style. Just Shutters also provides a colour matching service so that your shutters can be made to match any colour scheme. To find out more, call Just Shutters on 01962 670157 or follow the buttons above.